Guidance and support on making a formal complaint. For serious issues, or those you don’t feel like you can solve informally, then you can make a formal complaint. Below are a series of guides that have been produced to help you navigate the complaints system and information on how to escalate a complaint if you are not happy with the response you have received. A one-stop shop for the public and social care professionals to understand and have clarity on how to make and respond to complaints. Healthwatch England, the national support body for local Healthwatch, have worked with Citizens Advice to produce a set of guides that help people navigate the current complaints system. 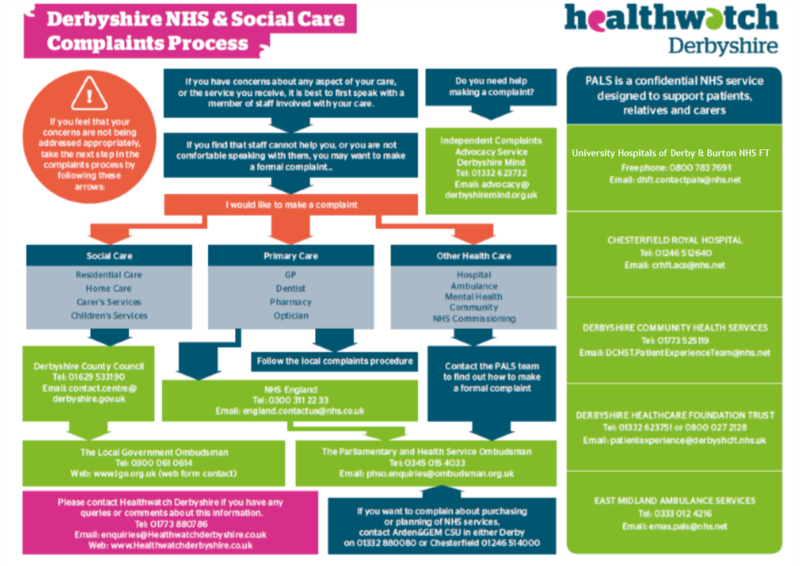 If you would like to place a formal complaint about a service or treatment that you, or someone else, is currently receiving or has received from the NHS then Derbyshire Mind, the Statutory NHS Complaints Advocacy Service, can help you to use the NHS complaints process. A service to support people to make a formal complaint about their NHS care or treatment, including any complaint against an organisation or service funded by the NHS. If you are unhappy with the service you or others have received from a hospital doctor, dentist, GP surgery or any other NHS service you can raise your concerns about it. By raising your concerns it can help put things right and the NHS can learn from your experience. This could include an explanation, an apology and information about how the NHS has used your experience to improve services or care. The service is available for any Derbyshire resident who wishes to make a formal complaint. You can also complain on a friend or relative’s behalf as long as they agree; you should get their permission in writing. If your friend or relative is very ill, or does not have the capacity to give permission because of an impairment or disability, you may complain on their behalf without their permission, although the health provider will wish to confirm their lack of capacity before accepting the complaint. You may raise a complaint, or take over a complaint on behalf of a friend or relative who has died even if you do not have their written permission. How can the service support you? Listen to your concerns and help you think about what you would like to achieve from your complaint, for example an apology, an explanation and/or an improvement to NHS services. The Parliamentary and Health Service Ombudsman look into complaints where an individual believes there has been injustice or hardship because an organisation has not acted properly or fairly, or has given a poor service and not put things right. They make final decisions on complaints that have not been resolved by the NHS in England. Their powers are set out in law and the service is free for everyone. You must contact to the organisation that your complaint is aboout and give them a chance to put things right before going to the Parliamentary and Health Service Ombudsman. The legal duty to be open and honest when things go wrong. What it means for their patient.